The word “fusion,” as a musical genre identifier, is a loaded term. At worst, it conjures images of endlessly self-indulgent electric guitar solos, overactive drummers buried deep behind epic drum kits, and seven string electric basses strapped up way too high. At best, it has given us timeless albums that were more sui generis than the mere mashup of distinct styles that it implies. 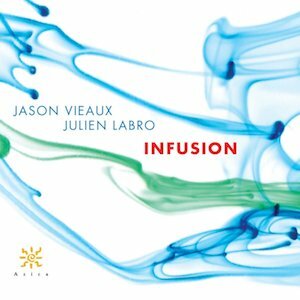 With their album Infusion, Jason Vieaux and Julien Labro suggest a subtle alternative path to stylistic integration that effectively presents several diverse performance approaches all under a concert music umbrella. Taking a staple of modern guitar chamber repertoire like Radames Gnattali’s Suite Retratos and infusing it with aspects of different traditions, leaves Gnattali’s structural context in place. In his arrangement of the Tears for Fears classic, “Everybody Wants to Rule the World,” Vieaux diligently reproduces various components of the multi-track original. But he and Labro infuse it with a soloing approach drawn from jazz. In Labro’s stylistically agile arrangement of Piazzolla’s “Escualo,” the two infuse the song with contemporary references that blend with the original material. The inclusion of Vieaux’s arrangement of Pat Metheny’s “Antonia” is an appropriate nod to a master of fusion (and infusion), an artist who has added elements of Brazilian music, classical structures, and Americana to his unique brand of jazz. Leo Brouwer has drawn from Afro Cuban sources throughout his career, infusing his concert music with the vibrant rhythms and characteristic harmonic flavors of his native culture.